Often people with a passion for collecting or making quilts end up with closets and drawers full of these beautiful objects. Because they are unsure of the proper procedure for hanging a quilt or they aren't quite sure of interesting ways of displaying them, the quilts often never see the light of day. If you are lucky enough to have a beautiful quilt you would love to hang, here is the correct way of hanging it. Cut a piece of fabric 4 1/2" wide and 2 inches shorter than the width of your quilt. Fold right sides together and sew a tube using a 1/2" seam. Hand sew to the back of your quilt at the top. You now have a sleeve to put a rod through. I have found that making the tube provides a more stable sleeve than by merely just turning under a 1/2" seam on a single piece of fabric. You can purchase decorative drapery rods to hang them from. 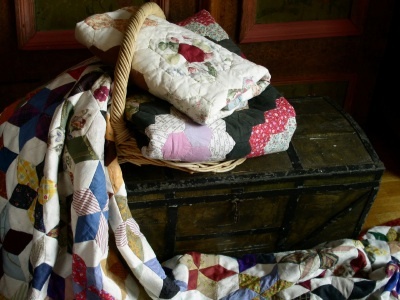 This way you can change the quilts often and display more of them. Now you are ready to hang your quilt anywhere. 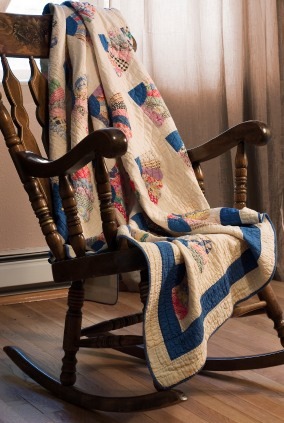 When you choose a spot for hanging a quilt, be sure to keep it out of direct sunlight. Because this is made of fabric, the sun will fade the quilt and also hasten the deterioration of the fabric. If you have damaged quilts that are not valuable, you can cut them, save the salvageable pieces, and frame them or create a collage of quilt pieces. Once you find ways of hanging quilts and try some various ways of displaying quilts, you and others will be able to enjoy them. Don't hide your collections in a bureau draw or closet. Bring out these wonderful works of art and enjoy them every day. Gloria Daniels has worked in many areas of the home decorating field and has been helping clients decorate their homes creatively for over 20 years.